Just as most people cast their last, rueful glances at their last-gen consoles, Atlus steps in to give us all one more reason to dust it off again. Back when the PS3 was just starting to gain momentum, and gamers the world round felt the urge to migrate from the PS2, Atlus published Persona 3, Persona 4, Odin Sphere and whole mess of iconic titles that took full advantage of the specs we’d come to appreciate over the life of the PS2. These weren’t heartless cash-grabs, either—they were genuinely experimental and exciting titles that still stand out as some of the greatest experiences available on their respective platforms. Lost Dimension comes at a time when even GameStop is doing its damnedest to get people to migrate over to the PS4’s heavy artillery. This probably isn’t going to be the game that gets most people to hold off on selling their last-gen consoles, but it’s a strong title that, while flawed, delivers an excellent and surprising gameplay experience. When gamers inevitably start sheepishly buying back consoles that they sold off years ago, I anticipate that this is going to be one of the titles that enjoys a small cult following. You control Sho Kasugai, a soldier from S.E.A.L.E.D., the UN’s special unit of psychics, whose mission is to infiltrate a strange pillar that has appeared in the middle of a major metropolitan city. When Sho arrives at the pillar, he finds himself with a small group of other members of the S.E.A.L.E.D. unit, but with a hazy memory. There, the team encounters a strange being calling himself The End, whose goal, unsurprisingly, is to destroy the world. While this certainly isn’t the most inspired plot on the planet, it’s mostly just a premise for you to climb the pillar and dispense some indiscriminate justice. There’s a catch, however. At the end of each floor of the pillar, you must root out and eliminate a traitor from among your ranks. While the first traitor you encounter is pre-scripted, the game randomly creates a new traitor at each level, making it more and more difficult to detect them. To give you the bare bones, Lost Dimension is a turn-based, squad-level strategy RPG with gameplay reminiscent of Valkyria Chronicles. Battles are mid-paced, strategic affairs that require a great deal of teamwork and attention to unit placement. Characters that stand within range of a shared target can aid each other’s attacks, a tactic which enemies can also use against you. Each character has a unique set of skills and a strong combat role, giving strategy-savvy players the satisfying challenge of maximizing their potential. Difficulty-wise, Lost Dimension ranks in the mid–high range depending on your level of experience, but those with a lot of SRPG experience will find this an easy game to settle into. The members of S.E.A.L.E.D. gain access to new skills fairly frequently, allowing them to specialize even further into support, attack and control roles. The skill tree that handles this progression feels a little glacial, considering how you only gain extra skill points every two levels, and a lot of them are just passive abilities. However, characters gain levels pretty frequently, so even when they’re not in use, early in the game, you’re never hurting for skill points. I found the combat to be extremely fun and engaging, and each scenario lends itself to tactical experimentation. Enemies present a tough challenge individually, but their numbers are never overwhelming à la Valkyria Chronicles. There are certain enemies that seem incredibly broken at first glance, but as you try new tactics, you realize that they just require a different approach to be taken down. Similarly, two of the characters have free movement (one through levitation, the other through teleportation), which makes them incredibly flexible assets in a fight. The enemies, unfortunately, do tend to repeat themselves floor by floor, merely gaining more abilities and higher HP counts as you go. However, new varieties pop up from time to time, and their roles are usually varied and powerful enough that the player feels a twinge of anxiety whenever something unexpected shows up. 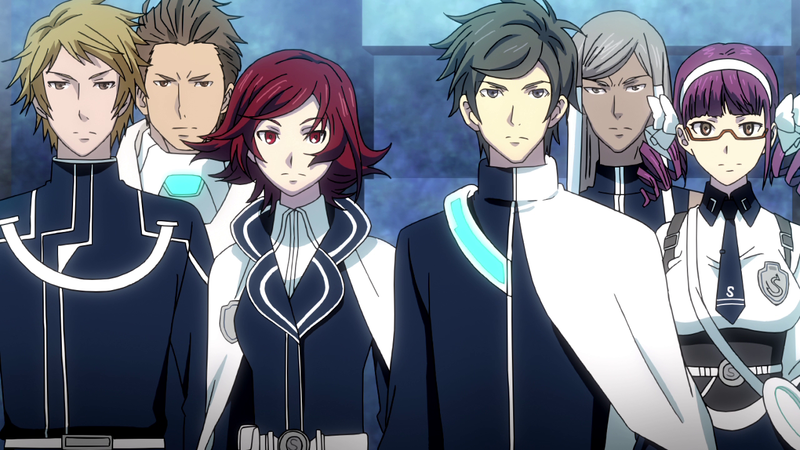 In Lost Dimension, the characters spend a lot of time grousing about who the potential traitor is—though, to be fair, it’s a really big part of what makes this game unique. The player must remain vigilant and pay attention to the interactions Sho has with his teammates in order to detect any traitors before they start trying to kill you. Every time you end a battle, you have the chance to talk with members of your team, which gives you a host of interesting options. The first two people Sho talks to usually gain more camaraderie toward him, which reduces the chances that he will be eliminated. However, unless you’re a total clownshoes and piss everyone off, it seems like Sho’s well-rounded abilities and participation in every battle allow him a certain degree of immunity from the elimination process. There’s also an added benefit to improving relationships between characters. As they trust each other more, team members will help out with attacks more often, becoming more effective in combat when paired together. That said, a lot of the characters’ personalities feel pretty two-dimensional. While you’ll never really mistake one for the other, I found myself railing at the amount of times I had to read or hear the same piece of information as filtered through 11 separate characters. Granted, with a game that has such a sensitive and important traitor mechanic, it would send a lot of false signals to have certain characters be conspicuously silent at certain times, but I think the dialogue is easily the weakest aspect of the experience. It gets borderline reality-show–level bad at times—one character even utters the immortal words, “I’m not here to make friends.” Nevertheless, the dialogue is fully skippable if it ever comes to that. While these interactions have occasionally tipped me off to a traitor, Sho’s primary method of detection comes right at the end of each battle, where he senses the inner thoughts of his teammates in a confusing jumble of text, character art and sounds. I wasn’t able to get much other than dim associations out of this, however, and it seems like all three elements are meant to make the player uneasy, more than anything. 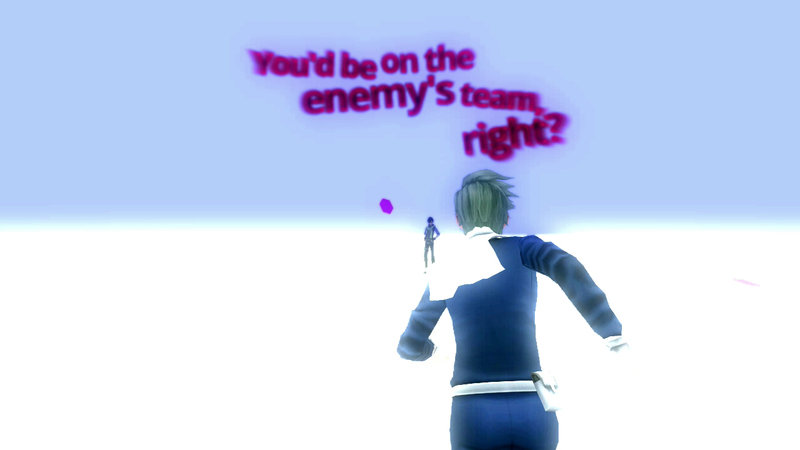 Luckily, Sho also gains a limited stock of Vision Points at key points in the game, which can be used to play a short minigame which can tell you if an individual member of your team is the traitor. Each battle shows up with a roster of the characters that participated in it, and the number of “voices” you heard. This forces you to really switch around your team and use your deductive skills to decide how to spend your extremely short supply of Vision Points. On top of all of that, you’re not the only one who gets to decide who lives and who dies. The whole team votes based on the performance of each member in combat, how often certain players healed them when they needed it, and their number of kills, assists and so on. These relationships can cause some interesting dilemmas, because when characters tend to spend more time on the bench, they also tend to get targeted more often by the others. 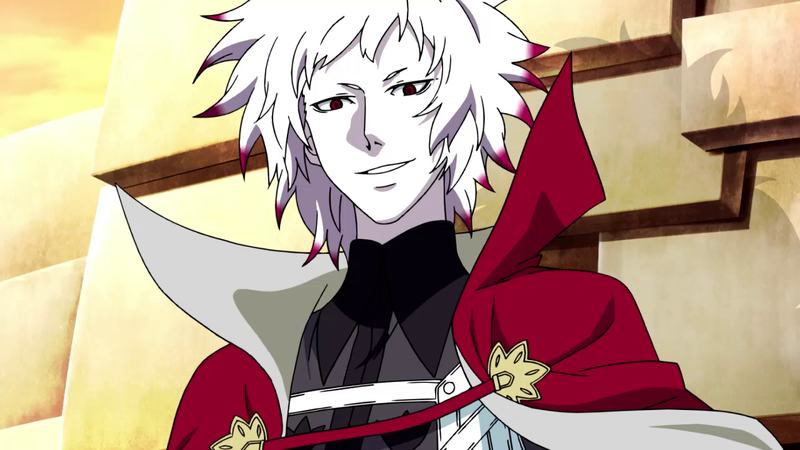 Similarly, if the traitor turns out to be one of your favorite characters, their reputation can take some serious time and effort to tarnish. Sho can occasionally influence the other members to vote for a particular person through post-combat dialogues, but it’s generally best to avoid pointing fingers until you’re sure. Whenever a character gets eliminated from the party, they leave behind all of their abilities in a Materia, which can be slotted onto other characters. This allows the equipping character to use all of the abilities the traitor (or, I suppose, completely innocent party member) had at the moment of their death. It’s actually kind of cool to see what kind of combinations can arise from this system, even if it is a little bit morbid, and it gives you an incentive to level up the traitors in your midst and give them useful abilities. It also means you’ll never be mourning the loss of one teammate for long, as soon you will have an invincible super-team that can waste enemies easily. 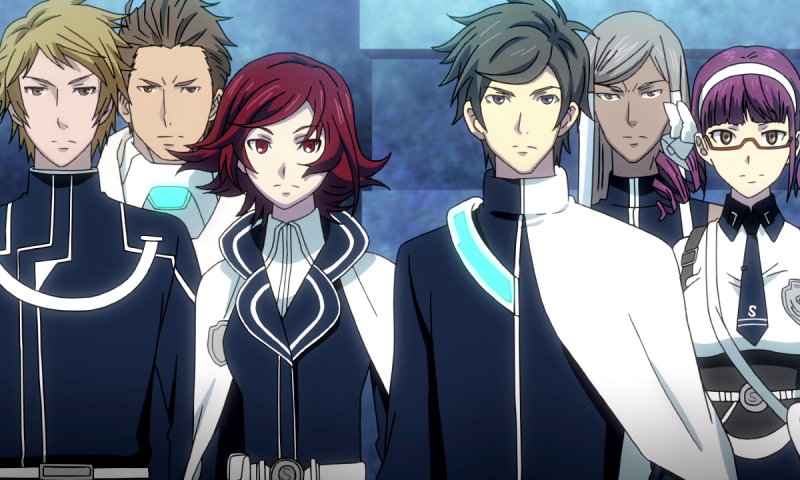 Lost Dimension nails just about every system it puts into the player’s hands. Even with minor quibbles about slow skill advancement, repetitive enemies and a lackluster script, this game draws you in with systems that feed excellently into each other. By the time the player finishes talking with teammates, they’re about ready to drop a Vision Point to check on a potential traitor. Once that’s done, it’s time to start leveling up and re-equipping. Then you head out into the field to scrap some enemies and ruin the traitor’s reputation. The cycle is so tight and well-developed that I found myself pouring hours into this game, just following whatever thread was interesting at the time. The art of Lost Dimension is pretty easy on the eyes as well. The tepid dialogue actually features some smart animation on the character portraits, which themselves are iconic without being outlandishly anime in design. Cutscenes run the range of fully-animated anime sequences to in-game renders that actually look pretty sweet. 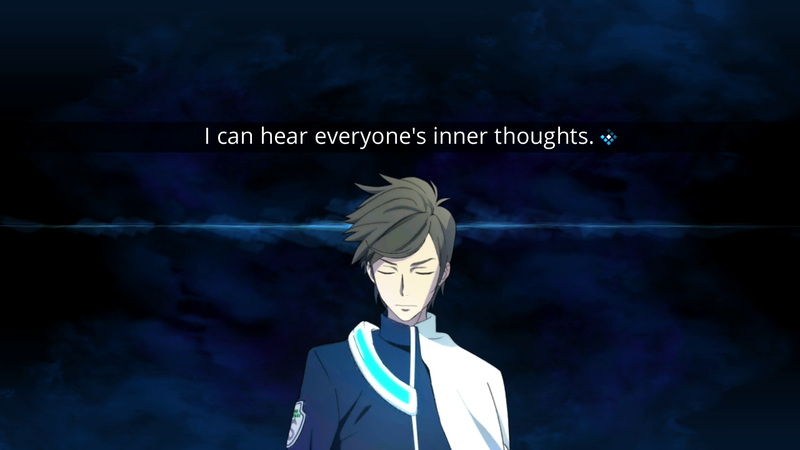 As a whole package, I think Lost Dimension is a diamond in the rough. True, it could use its fair share of polish, and coming from a company like Lancarse–the developer behind the Etrian Oddysey series and the seriously underrated Shin Megami Tensei: Strange Journey–such a lack of polish is actually kind of surprising. Nevertheless, this is a seriously strong title from a platform that never seemed to reach its full potential in the RPG genre. Fans of SRPGs can confidently slot this one in next to Valkyria Chronicles and Disgaea 3 in their collections, while newcomers to the genre will find the mix of systems at once refreshing and exciting. I expect I’ll be giving this one a second playthrough—perhaps even a third.